When we saw the design drawings and early prototypes for the new GT binding, we knew Kreuzspitze was onto something good. As is their style, the small Italian machine shop quietly worked to refine the binding while paying no attention to marketing and associated bombast. The resulting GT is a lightweight masterpiece which adds both lateral and forward release adjustability to a race binding. Unlike some other race bindings, you don’t have to hesitate to ski it unlocked. Race-weight with little compromise is the new now. Innovative composition of Ergal aluminum, titanium, steel, and structural carbon fiber. Heel pieces have lateral and vertical release adjustment from 5-10 on the “tech” scale. 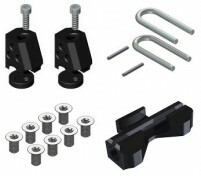 Toe levers have two lock positions to work with various degrees of boot wear. Detents every 90° let you use a riser or skin with your heels flat on the ski. Optional heel flaps and an additional heel riser can bolt on to increase speed during transitions and provide even more versatility. Lateral elasticity is similar to touring tech-bindings with spring-on-post design. Integrated crampon receptors accept most crampons, slid in from the side. Optional adjustment plates adapt to various boot-quiver needs. 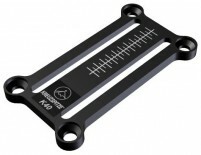 Fully compliant with ISMF racing rules and a very low weight, 161g. Designed and produced in Italy, patent pending. It looks like the heel uses a U-spring, and the ends of the U have some kind of sheaths on them. What are those for? Do they spin so you can get more consistent release and/or reduce wear on your boot's heel fitting? Or is that wishful thinking on my part. Hey Peter! You nailed it. There is a U-spring that can slide in and out of the "sheath" which helps dictate release value. Can't believe nobody else has thought of using that method before! I have not ever noticed that they spin though, I think there is something in there stopping them. That being said, I have easily a few hundred days on my GTs by this point and the pins are nowhere near worn out. I've been using these bindings now for about 80 days and love them. I weigh 145lbs and use TLT6 boots and ski mostly soft snow. I use them on 112mm skis. I wanted something where I could set the release to around 6. These things are a dream to tour with and I've had no issues with them. I bought the optional extra risers with the heel flap but in the end I hardly use them. My only complaint is that its hard to attach a leash to the toe (when you want one). My skis have quiver killer inserts for the Dynafit Radical ST. Looks like the fore/aft distance between holes on the heel piece is roughly 52mm. The front two holes for the heel piece look to be 31.5mm and the rear holes look to be 36mm apart. What adjustment plates would I need to buy to enable the heel pieces on these bad boys to screw in to my already quiver killed mount holes? Toe piece compatibility is not an issue as I am mounting the whole binding to a different pair of skis than the ones I have quiver killed. Hi Robert, you need the 14mm adjustment plates, found here. It doesn't look like the hero riser for the SCTT will fit this heal. Is there one available? 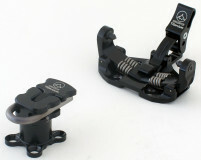 Hi Teague, there is a new high riser option for the GT that screws onto the race heel-flap accessory. We should have them in the next day or two and will update the listing. I see that someone already asked if the heel peices are available alone. Hi Brendan, we are currently out of stock on the heels, sorry! 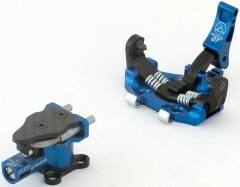 Does Kreuzspitze make optional heel risers for the GT similar to those which they make for the SCTT bindings? Hi Fedor, these use a 6mm gap, though you can go closer. There are a couple accessories in the works for this binding, but nothing in production yet. Is it possible to by only heel pieces of these bindings? Hi Fedor, yes we have those listed here. Hi Chris, the hole pattern is identical to the SCTT. Unfortunately it doesn't match the Radical toes, but just about every other race toe. Just wondering if you have any specs on the dimensions of this binding? Do you know what the heights of the toe and heel pins are? 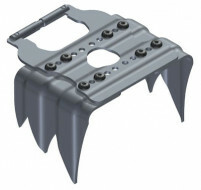 I want to figure out if I can use the Kreuzspitze ski brake with this binding and my boots (TLT6). Hi John, we have the toe pins at around 29 mm, and the top of the heel pins at 31mm. Middle of the heel pins is listed in our pin height list. I'm gonna need some new skis to put these on! That can certainly be arranged! Do you know what the difference in pin height will be with adjustment plate/dynafit adapter? Hi Joe, the K plates are 5.5mm thick, but we don't have measurements just yet for the stock pin heights. Thanks for the feedback on the SCTTs, I'm looking forward to the new normal.